This casual, humorous voice then walks the layperson through the NASA technology left behind, and how Watney will hack it to stay alive. He needs more food, more water, a means of communication with Earth, and not to make any big mistakes that will get him killed. It’s amazing that a guy growing some potatoes and doing chemistry experiments is such a page turner, but it really is. Could this be the first space procedural? I bought this book in an airport and it was at No. 4 on the New York Times bestseller list, so obviously everyone who has picked it up has been glued to it, and I was too. 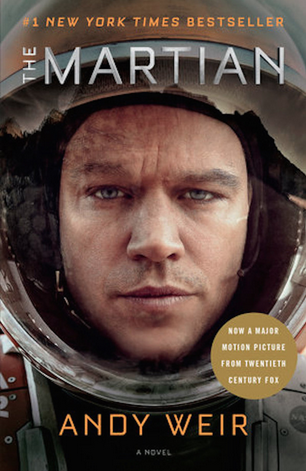 I also have now discovered that The Martian was originally self-published, which makes it even more likable. However, at the same time as I read all 435 pages with great relish, the part of my brain that thinks was screaming in agony. The character is admittedly supposed to be the kind of happy optimist who deals with stress by making jokes, but his endless “Whee! Yay! I’m alive!” delivery—or, sometimes, “I have a hell of a backache. I’m sick of this”—became simplistic and grating. Also, everything he tried mostly worked, which life mostly doesn’t, and so by the end when he drives 3,200 kilometers with only one minor accident, and then gets launched into space in a shuttle with a hole in the top…. it was all so flat it was impossible to care. Sure the adventure probably needed a person incapable of introspection to deal with the stress, but a person incapable of introspection doesn’t bring much to even the most fabulous adventure. I do believe that individual human beings in crisis situations often behave heroically, and Watney’s fellow astronauts risking their lives to return for him seemed reasonable. But the American government makes decisions that result in many, many people getting killed every. single. day. for reasons of politics and expedience. Those people are usually not heroic and adorable like astronauts, but still, if you weigh all lives equally, it’s hard to enjoy Weir’s fantasy. Look at the ongoing tragedy of the Syrian refugees, or what happened to the low-income residents of New Orleans during Hurricane Katrina. Where’s the basic instinct of every human being to help those people out? Obviously people read thrillers to get away from reality, and I should too, but I can’t do it.